Displays that can be folded and rolled up have been shown in prototype smartphones, wearables and other devices -- but when will such products be available? Advances in technology suggest they aren't too far off in the future. Such devices could start showing up as early as next year or 2018, said Jerry Kang, senior principal analyst for emerging display technologies and OLED at IHS. Manufacturers are trying to launch them in devices like tablets that can fold into a smartphone-size device. It's possible to use these displays in wearable devices, but reliability, weight and battery life need to be considered, Kang said. Small folding screens will likely come before larger ones, mainly due to the economics of making such displays, Kang said. The displays will be based on OLED (organic light-emitting diode), which is considered a successor to current LED technology. OLEDs don't have lighting back-panels, making them thinner and more power efficient. 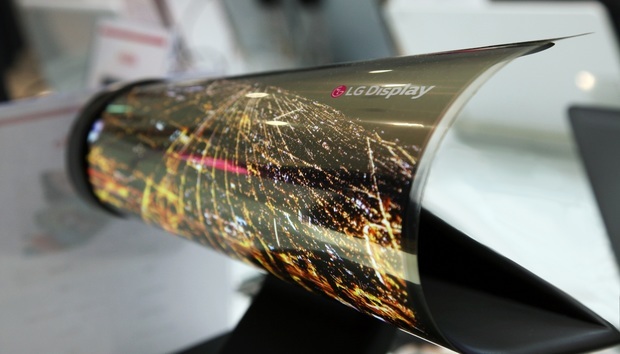 At CES this year, LG showed a stunningly thin paper-like display that could roll up. The company projects it will deliver foldable OLEDs by next year. There are advantages to screens that can be folded or rolled up. They could lead to innovative product designs and increase the mobility of devices, Kang said. For example, it could be easier to fit screens around the contours of a battery and other components. It will also provide a level of flexibility in how a user can change the shape of a device. But challenges remain in making such screens practical, Kang said. A display has multiple functional layers such as cover lenses, touch panels and polarizers, all made of different materials. A large number of layers could limit the ability to bend and fold. But removing layers also presents problems. For example, removing the touch panel could make such a screen useless for smartphones and tablets. The size of batteries and circuits are of lesser concern in designing bendable screens, Kang said. The screens can be folded around components. Displays that can fold and roll are an extension of flexible displays, which are already in wearables, smartphones and TVs. For example, some TVs have flexible screens that are designed so that they can be slightly curved. Samsung and LG started using flexible AMOLED displays in smartphones in 2013 and are adapting those screens for wearables. Those companies are also leading the charge to bring displays that can bend and fold to devices. The sorts of flexible displays that are used in curved products are still in their infancy, but IHS projects such screens to continue siphoning market share from non-flexible displays. In 2022, 433.3 million flexible displays will ship, compared to 3.6 billion units of non-flexible displays.